Winner of Foodie Freebie Friday: Microplanes! Yay... it's the weekend! Hope you all had a fabulous week and are looking forward to something fun and delicious this weekend! This week's Foodie Freebie Friday helped me learn more about readers and their preferences in the kitchen between cooking and baking. It was great to read about which you prefer between the two and why. Thank you for sharing your preferences! For me, perhaps 10 years ago I would have responded with being more of a baker. The reason I had such an interest in baking was because in my parents' catering business, they didn't do many sweets or baked very much. Back then I also had a side business making custom special occasion cakes, various baked goods and I was known for my cheesecakes. It was a lot of fun baking for my clients and coming up with cake and frosting flavor combinations as well as decorating them or incorporating those cake flavors into cheesecakes. Since I've moved away from the suburbs and from my clients, I stopped baking and focused more on cooking. It allowed me a chance to be creative without specific measuring, to challenge myself in creating dishes with random ingredients and learning more about the science how heat and various ingredients work together. But these days I want to be more balanced between cooking and baking. I host weekly dinner parties focused on cooking and I'm also warming up baking skills again ever since I joined the Tuesdays With Dorie group. Ideally, I would like to be more well rounded in both cooking and baking in the kitchen, always ready for the next challenge. Whether you're a cook or baker, one tool that is helpful to have in the kitchen is a Microplane®! This week I'm giving away a set of 4 different Microplanes for a lucky reader to use. 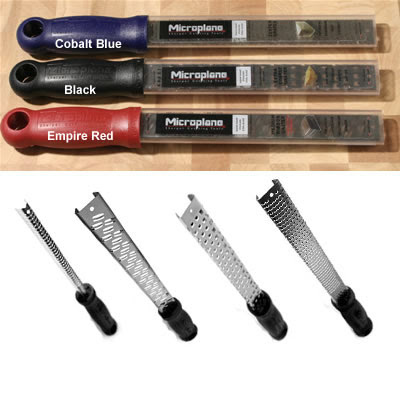 So which lucky reader will receive a set of the following 4 Classic Microplane® kitchen tools and decide what colored handles (in black, red or cobalt blue) on??? 1 Zester / Grater - Originally a woodworking tool, this best seller grates even the hardest Parmesan Reggiano as well as other hard cheeses into fine lacy wisps. Ideal for topping your favorite spaghetti and meatballs or a Caesar salad. It’s also wonderful for effortless citrus zesting to add natural flavors to a lemon crème brulee or a basic vinaigrette. 1 Extra Course Grater - For Grating/Zesting of Chocolate, Hard Cheese, Citrus Zest, Coconut, Ginger and Garlic. Use this grater to make chunky slivers for tacos and salads. 1 Medium Ribbon Grater - For Grating of Soft Cheese, Butter, Chocolate, Cabbage and Apples. The Microplane® Medium Ribbon Grater grates ingredients in both directions, saving time and effort. It is one of the coarsest of our blade styles. 1 Spice Grater (only Available in Black & Red) - Originally a woodworking tool, this spice grater tackles even the hardest spices like nutmeg with ease. Ideal for grating a touch of fresh cinnamon or chocolate over the top of your hot drink. I am definitely a BAKER! When you cook, you cook something, and then have to eat it right away and leftovers are never as good as the first time around. Congratulations VanBaby! I wonder which color handles you'll pick between the two! Please email me at [email protected] so I can confirm what color handles you'd like for your Microplane set and the mailing address in which to have your Microplanes sent to. Thanks again to all those that commented and stay tuned to the next Foodie Freebie announcement on Monday,February 23, 2009! Don't feel discouraged if you haven't won yet - I have a whole year's worth of freebies ahead and next week is one that you won't want to miss!